The summer before my senior year of college, I did an internship at Walgreens. Although I wasn’t interested in going into retail management, the position was going to look good on my resume and the pay was above average. It ended up being more fun than I anticipated. The job definitely had its lows—like confronting shoplifters and restocking shelves late into the evening—but I worked with a colorful cast of characters and I enjoyed chatting with customers while working the cash register (nerd alert!). When it came to restocking, my favorite items to put away were in the snack foods and candy aisle…no surprise there! I always volunteered to do those over the shampoos, the paper products, or the medicines…especially the medicines! 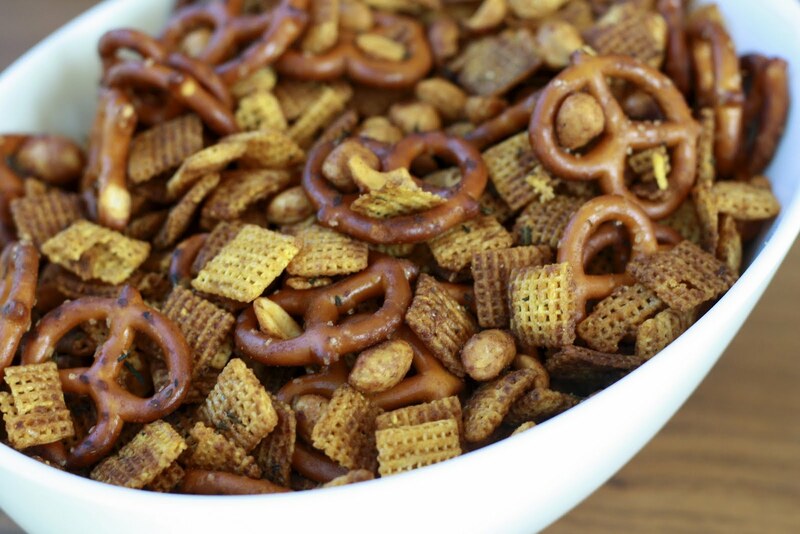 One snack food I remember restocking frequently were the bags of Chex mix. I was rather familiar with the flavors, including hot & spicy, peanut lovers, and honey nut, occasionally buying a bag to snack on during my shift. I must say, this homemade mix from Martha Stewart Living beats any of the bags I ever bought! Cayenne, garlic, and rosemary are the key flavors here. The original recipe made a puny amount. 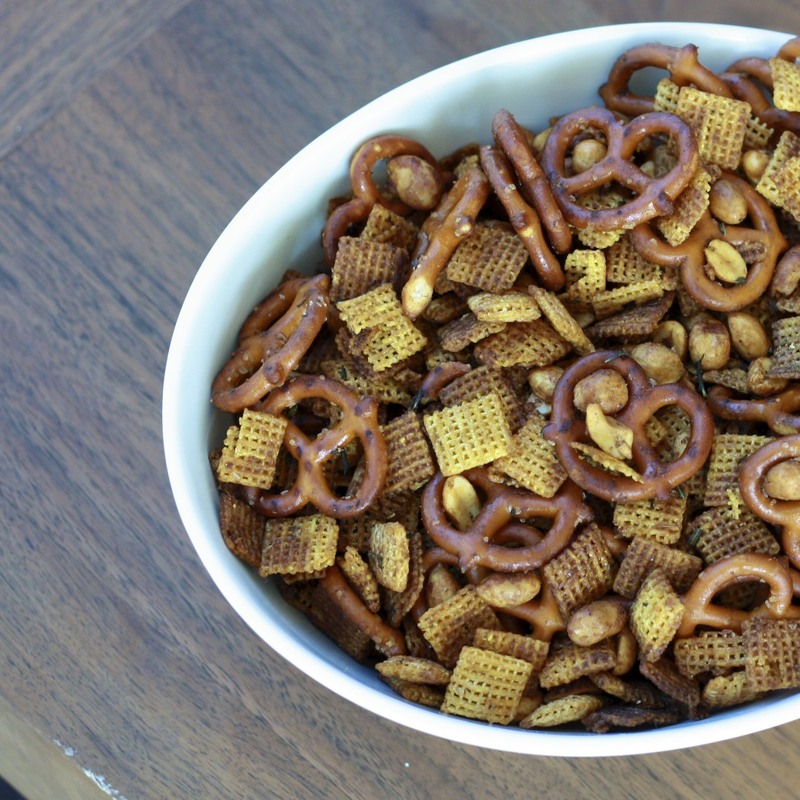 I tripled the recipe (my version is below) and it filled a gallon sized Ziploc bag. This ranks right up there with the Life cereal mix and is leaps and bounds of what you’ll find at your neighborhood Walgreens! 1. Preheat oven to 225F. In a large bowl combine cereal, pretzels, and peanuts (may need to divide into 2 bowls). 2. Mince cloves of garlic and mash into a paste with salt. Stir together garlic paste with melted butter, Worcestershire sauce, paprika, and cayenne pepper. 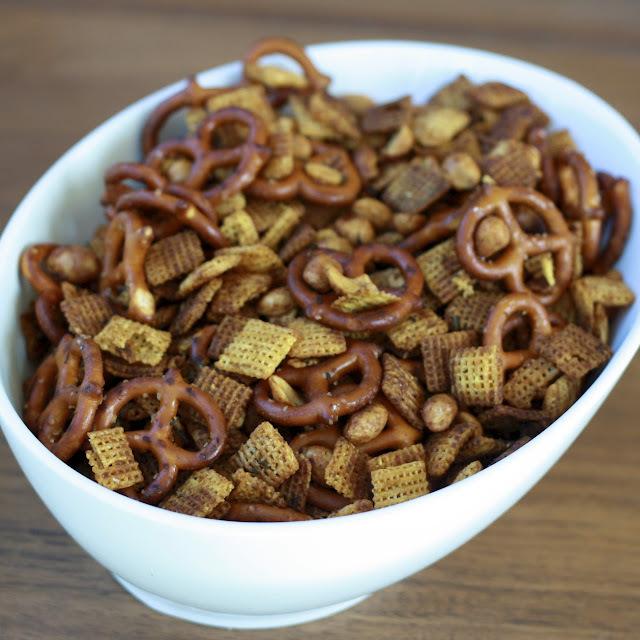 Pour over cereal mixture and toss to coat with a rubber spatula. 3. Spread mixture evenly on two rimmed baking sheets. Bake, gently stirring every 20 minutes, for 1 hour 20 minutes. Sprinkle chopped rosemary over mixture and bake for an additional 20 minutes. Allow to cool completely before transferring to an airtight container (will keep for up to 10 days). This content was originally posted on Honest Cooking in my featured column "Cooking the Magazines". This post is also linked to Eat At Home.